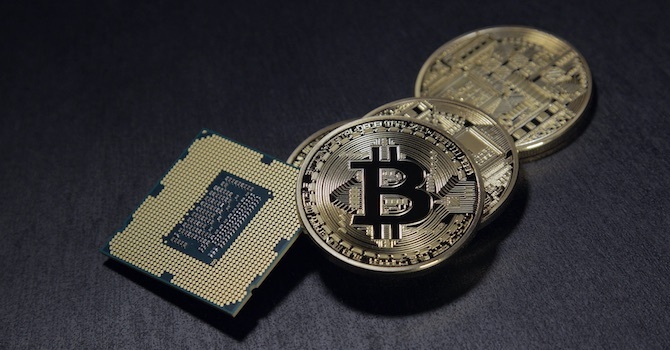 Cryptocurrency has had a steady rise in popularity since Bitcoin, the mother of all cryptocurrencies, was created back in January of 2009. 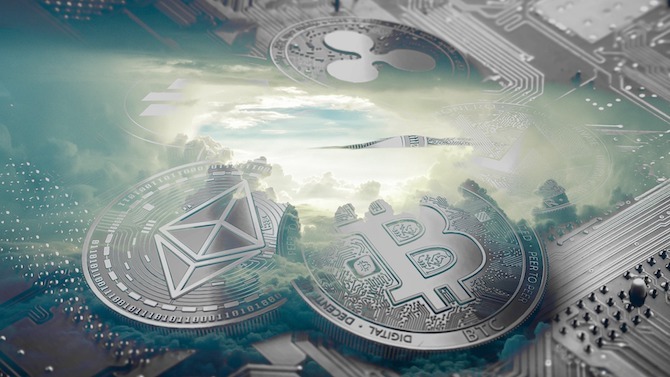 Cryptocurrencies provide a way for people all around the world to trade using a global currency while also giving them a way to escape banks and other financial institutions. Its popularity rose suddenly in 2017 when Bitcoin moved into the mainstream, its price going as high as $19,843 per coin by the end of the year 2017. More and more cryptocurrencies have been created over the last decade or so, and more and more ways to obtain them came along with them. Previously we've already covered how you can accept Bitcoin on your WordPress site and how you can earn money while blogging about Bitcoin. Today we'll talk about Coindirect. It's one service whose goal is to make it easier for anyone to buy and sell different cryptocurrencies. They're a peer-to-peer exchange and the subject of this very article. How does Coindirect keep you safe? Coindirect offers one of the easiest and quickest ways to buy and sell cryptocurrencies. It uses a peer-to-peer exchange where sellers can set their own prices and trade with over 30 cryptocurrencies using local currencies. Exchanges can be made 24/7, and there are no hidden fees. What you see on the payment page is all there is to pay. The company has truly worked hard to create a platform anyone can use to trade and invest in cryptocurrency of their choosing. You'll be happy to know that several security measures have been implemented to make every transaction secure. 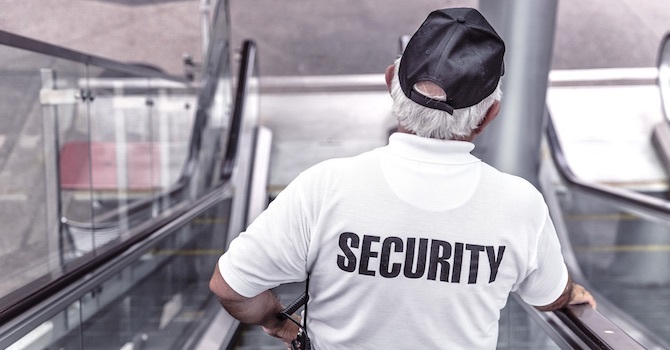 These include bank-grade security systems, escrow protection for transactions and a registration with the Isle of Man Financial Supervision Commission to ensure the service complies with international financial standards. Let's start this Coindirect review by quickly going over what Coindirect brings to the table. 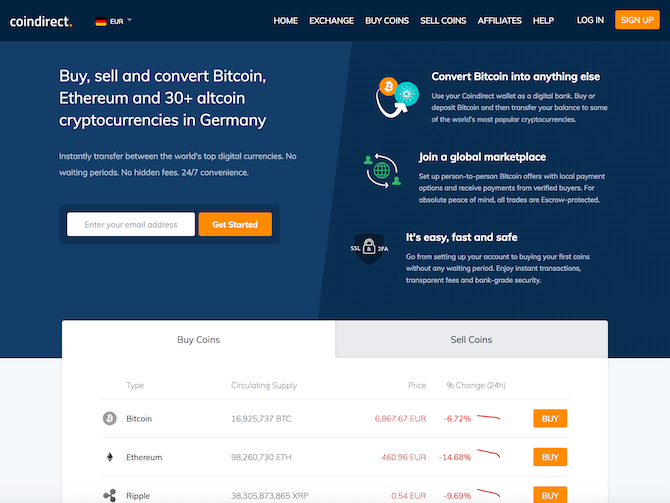 Multiple Currencies – Trade with Bitcoin or over 30 different altcoins, including Dash, Dogecoin, Litecoin and Siacoin. 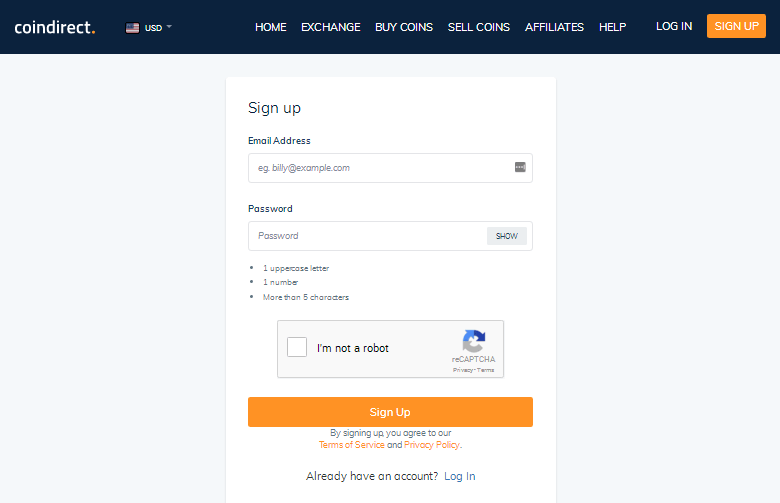 Buy, Sell and Convert – Buy, sell and convert with multiple cryptocurrencies. Sellers have the freedom to decide what their prices should be while buyers have a variety of different prices to choose from. One Platform – Manage all of the currencies you trade with or invest in within the security and convenience of a single platform. Open New Wallets with Ease – Coindirect makes it easy to open new wallets for every cryptocurrency you want to use. Simple Transfers – Transfer between your wallets with ease and send coins to and from third-party wallets with a few simple clicks. Security – Along with being registered by the Isle of Man Financial Supervision Commission and using the same security measure banks use, Coindirect protects your transactions by transferring your coins to a third-party location (escrow) until the transaction is complete. WYSIWYG – Coindirect is upfront and transparent about the fees it charges. The price you see on the payment page is final. There are no hidden fees for you to pay after the fact. Signing up with Coindirect is quick and simple. All you need to do is enter your email address, enter your desired password and complete the reCAPTCHA test. You'll be good to go after you confirm your email address. You'll be greeted by the Coindirect dashboard once you sign in. You should see a message telling you your personal details need to be verified before you can place an order. It's a simple process and only requires you to fill out your personal details (name, billing address, date of birth, etc. ), which sellers can see, and upload documents to verify your identity. 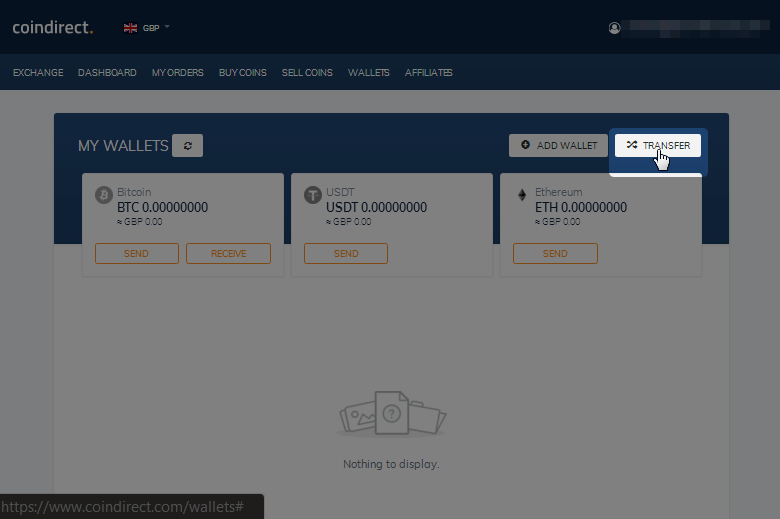 You may have also noticed Coindirect adds three wallets to your dashboard by default for Bitcoin, Ethereum and USDT. 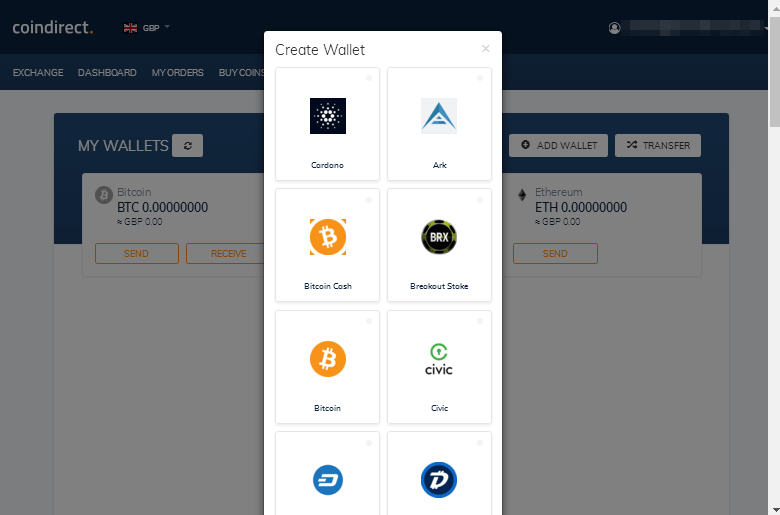 You can add more wallets by going to the Wallets tab, clicking Add Wallet, and selecting the cryptocurrency you want to add a wallet for. Let's get into how to use this service to buy cryptocurrency. You can start trading cryptocurrencies as soon as your identity has been verified. It's just a matter of clicking over to the Buy Coins tab, making sure the local currency you want to pay in is selected, and choosing the cryptocurrency you're interested in buying. Please note: These screenshots were taken in March 2018 and do not represent current cryptocurrency rates. Make sure to check current cryptocurrency rates before doing transactions. 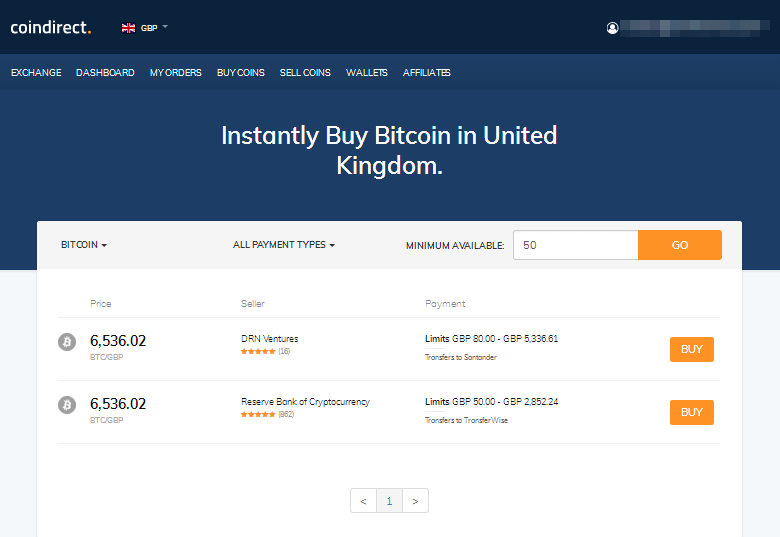 Once you decide which currency you'd like to buy and click its associated Buy button, you'll be greeted with all of the offers available for that currency in your region. You'll see the asking price for each offer, the seller's name, the seller's user rating and the seller's payment terms. Completing a transaction is as simple as entering the amount you'd like to pay or amount of coins you'd like to purchase and selecting the way you'd like to pay based on the available payment methods. 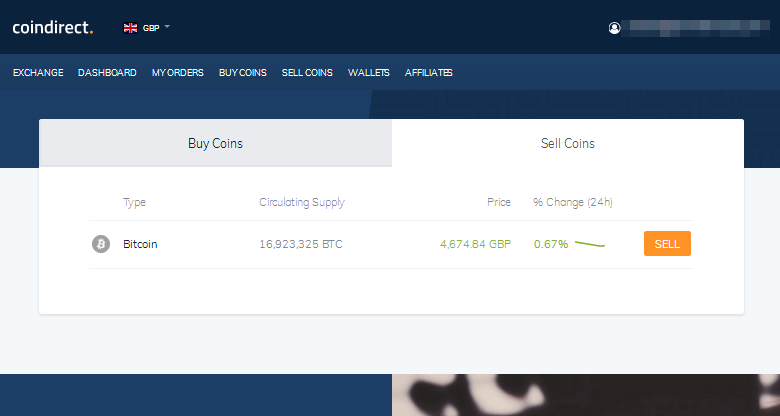 You can click over to the Sell Coins tab to sell your coins, where only Bitcoin is available to sell. Here's the thing with Coindirect. You can typically sell any type of coin you want. The catch is you'll have to convert altcoins into Bitcoins first. Fortunately, this is quick and simple. You'll use the Transfer function, which you can find in the Wallets tab. It's just a matter of selecting which wallet you want to transfer coins from after that. 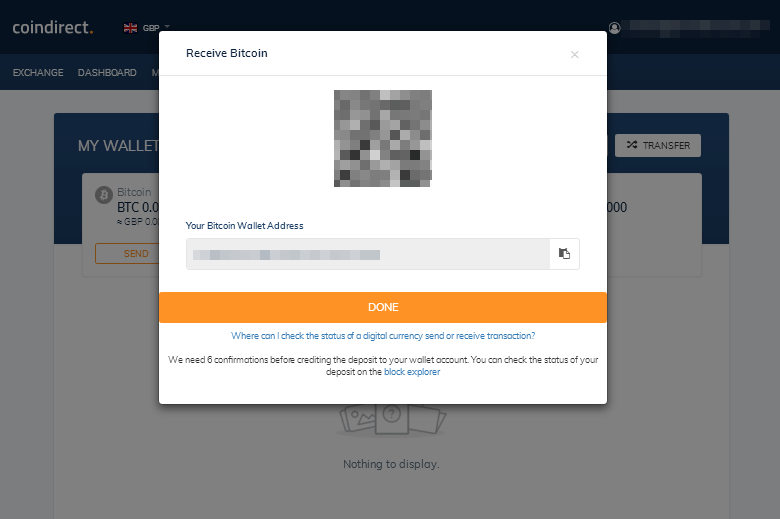 If you have Bitcoins in an external wallet that you want to transfer to your Coindirect wallet, head back to the Wallets tab, and click the Receive button associated with your Bitcoin wallet. You'll be assigned a Bitcoin Wallet Address you can use for the transfer. Only Bitcoins are allowed to be transferred into this wallet when they come from external sources. Coindirect states that “attempting to send coins to an incompatible wallet will lead to them to be lost in the blockchain, typically rendering them irretrievable”. 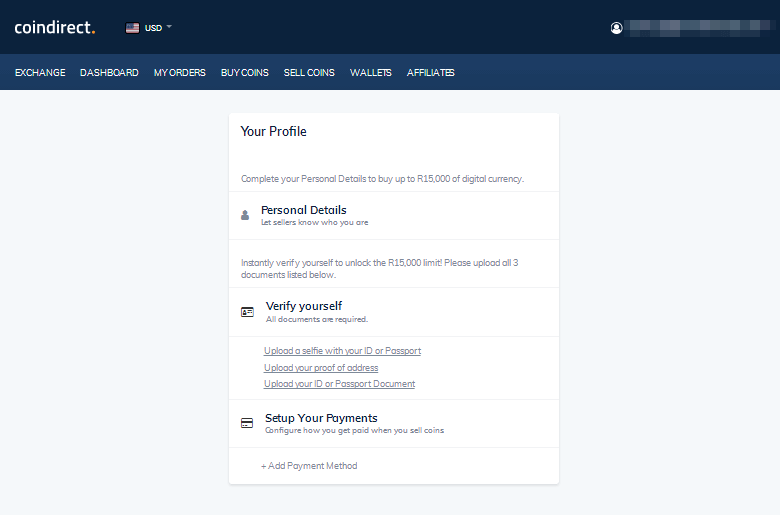 You'll need to define a payment method for your account before you sell coins. We talked about this in the Configuration section. All you need to do is go to the Dashboard tab, and go to your profile. Keep in mind this is the payment method the funds you make from Bitcoin sales will be sent to. It's just a matter of heading back to the Sell Coins tab and clicking Sell after that. You'll see which buyers are looking to purchase bitcoins, what their budgets are and what payment methods they prefer. Let's move on with our Coindirect review and go over fees and the support options Coindirect offers. 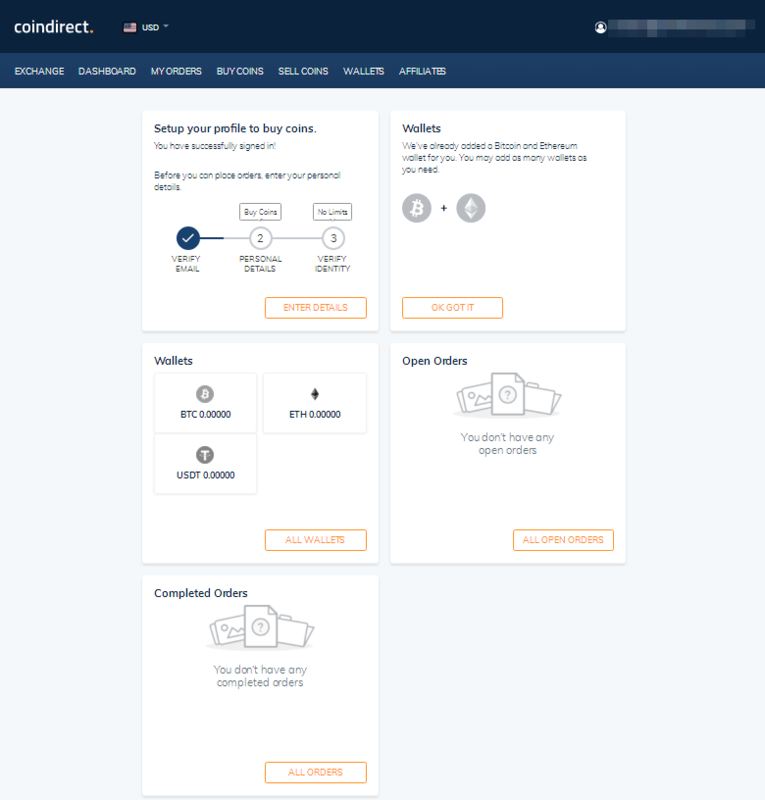 Coindirect is upfront about its fees. They charge you a 1% fee when you sell coins, no fees when you purchase them, and no hidden fees when you transfer, send or receive coins. There are no set fees for the latter scenario since exchange rates change, but the service's price for transfers are “what you see is what you get”. Some cryptocurrencies require Coindirect to move funds to a separate address before they're moved to Coindirect. An additional fee may be charged by that third-party network in that case, but that's out of the company's control. Support is only available in the form of email support at this time. There are also helpful tutorials on the Coindirect blog and in the website's Help section. We've touched base on a few of these points already, but we'll go over them again and add a few extra. The company operates out of London and the Isle of Man. They're registered with the Isle of Man Financial Supervision Commission to ensure they comply with international financial standards and best practices because of this. They've also implemented bank-grade security practices and escrow-protected transactions by transferring funds to a third-party location before they wind up at their destinations. The company also protects you by requiring all users, especially sellers, to verify their identities before they're allowed to complete transactions on the site. Buyers and sellers are also rated by users with a 1 to 5-star rating system, allowing you to quickly see which buyers and sellers have decent reputations. Lastly, you can protect your own account by enabling two-factor authentication during the log-in process. You can do this by linking your account to the Google Authenticator app. Once you become acquainted with the service, you can actually start using it to earn a bit of money and perhaps even a full-time living. There are a couple of different ways you can do this. 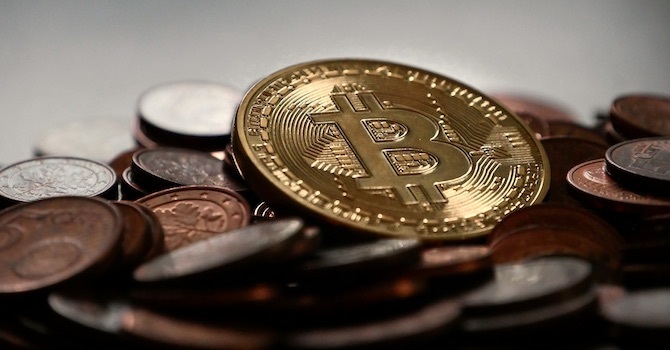 First, you can start a cryptocurrency business by investing in a large sum of coins, selling them and repeating the process. 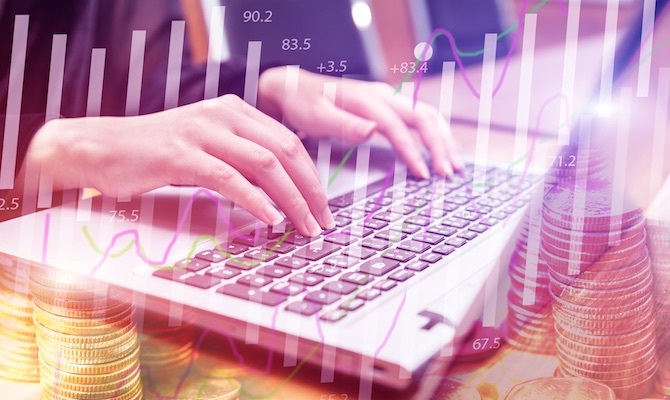 It's not the cheapest way to start an online business, but between how easy it is to use the service and how many security protocols they implement, it's one of the easiest and safest ways to start a cryptocurrency business. 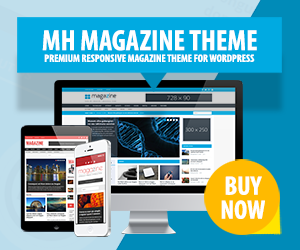 The second way to earn money with this service is to join their affiliate program. Currently, you can earn a 20-percent commission on trade fees when you refer someone to the service. You earn whatever base currency your referral traded in, and you'll continue earning throughout your referral's time with the service. Funds are sent to your Coindirect wallet. That's it for this Coindirect review. We hope you enjoyed learning about how trading cryptocurrency works with Coindirect. What's your opinion on Coindirect? 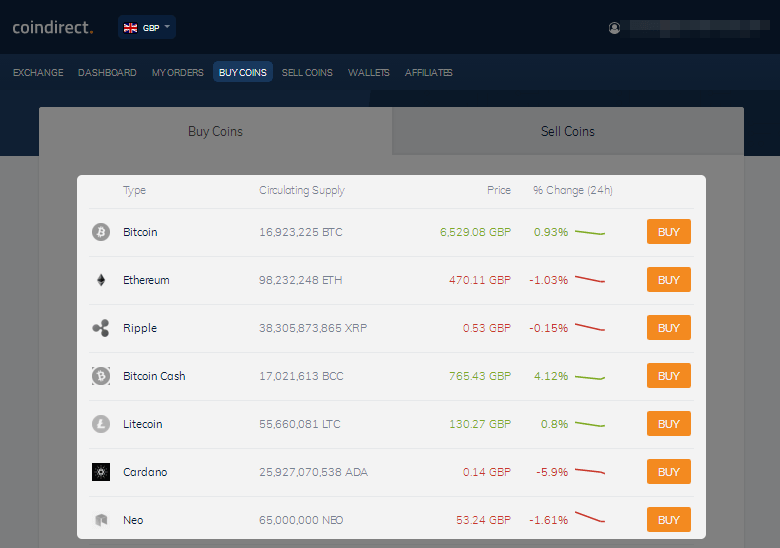 Have you used this platform already to buy or trade cryptocurrencies? We're looking forward to read your thoughts in the comments below! Disclaimer: This Coindirect review has been sponsored by Coindirect. The statements and opinions are our own. Trading Bitcoins or alternative cryptocurrencies has potential rewards, and it also has potential risks involved. Trading may not be suitable for all people. Anyone wishing to invest should seek his or her own independent financial or professional advice. Coindirect are by far the shoddiest and shadiest exchange I have had the displeasure to deal with. They do not take responsibility when their platform does not work and leave the user to pick up the tab, making increasingly silly excuses to as to why it was all the user’s fault. In addition they grant themselves rights over the user’s online wallet which simply are not in the ToS. Any attempt to transfer tokens out will result in a 3 DAY “pending” period for “New Users” when the user doesn’t have access to their own assets. Neither the term “New User” nor the “Pending Period” are set out in the ToS so they can be applied to anyone at any time. Avoid like the plague! I had a sad experience today also. I would rather stick to FIAT if this is the “future”… Regulation of cryptocurrencies cannot come soon enough to rid everyone of this type of crap. 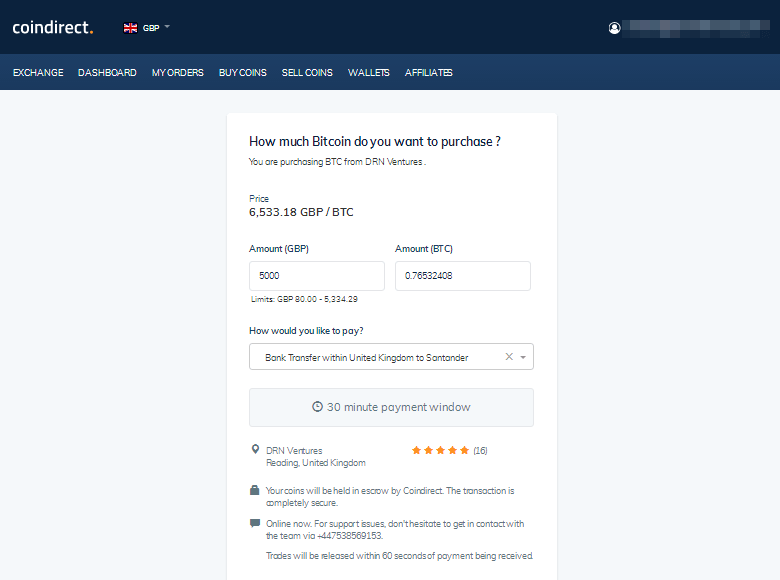 The minimum amount of purchase in Coindirect.com is £50. 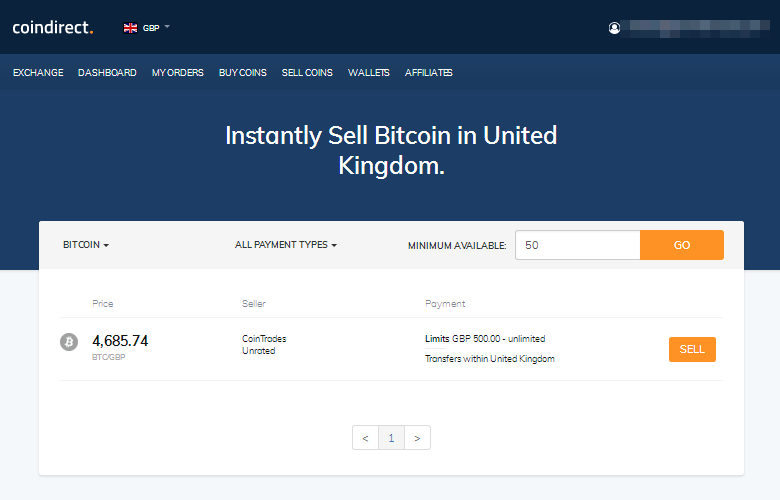 However, you cannot sell the coins even if they are worth £100 or if you convert your coins into Bitcoin. Coindirect is making it a trap for retail investors and preventing you to withdraw your funds. Guys think twice before you invest a single penny in Coindirect.